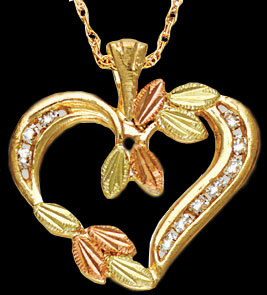 20 points of diamonds define this beautiful Black Hills Gold Necklace by Landstrom's Black Hills Gold. 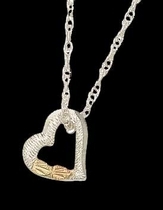 Ten diamonds set in an open designed Black Hills Gold necklace cast as a heart. 7/8" wide x 3/4" high. This Black Hills Gold necklace, like all the Landstrom's Black Hills Gold featured on our website, meets or exceeds the three legal criteria required to use the term "Black Hills Gold". 1) This Black Hills Gold necklace is made in South Dakota; 2) this Black Hills Gold necklace is made with yellow gold, rose gold and green gold; and 3) this Black Hills Gold necklace features grapes and grape leaves as part of its design.